Job seekers can send in their Alcoa application for a chance to work for one of the most successful lightweight metal companies in the world. Alcoa specializes in advanced manufacturing techniques and it currently the third largest Aluminum producer in the whole world. It is currently ranked #126 on the world famous Fortune 500 list. According to the company’s hiring policy, all candidates for Alcoa employment are required to be at least 18 years old to be deemed eligible. Please note that all applicants who do not meet the age requirement will be automatically excluded from the hiring process. The Alcoa application process is conducted on the company’s careers portal. All job seekers are required to submit their employment application online to be considered for the available careers at Alcoa. They can explore the careers portal to find the complete list of job openings at the company. They can select their desired location and career area to find the best-suited Alcoa jobs for their professional and academic backgrounds. Then they will be asked to create their own profiles on the online employment portal and to join the Alcoa talent network. After they set up their accounts on the Alcoa careers portal, they will be able to begin filling out their online jobs and employment form. In the following part of our article, we will provide job seekers with a detailed description of the main sections featured in the Alcoa job application from. For the first section of the Alcoa application form, candidates are asked to provide their resumes and their cover letters. They may either upload these from their computers or type them in the provided space. The portal will use the data they provide for this section to populate some of the fields in the following section of the form. 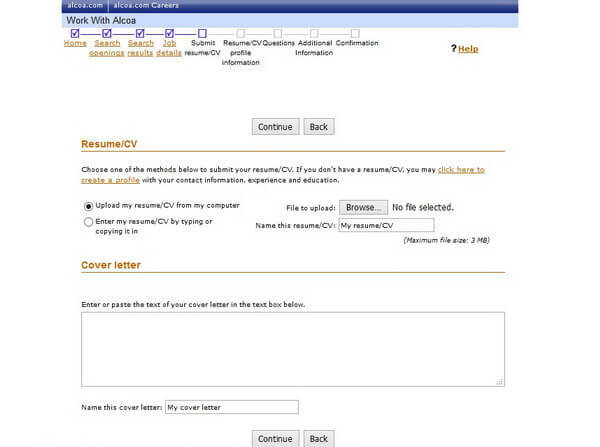 Candidates who do not wish to attach a resume to their forms will have to fill out the following section manually. This section of the Alcoa application form requires candidates to provide the main information about their professional and educational experience. They are required to go through the following subsections. 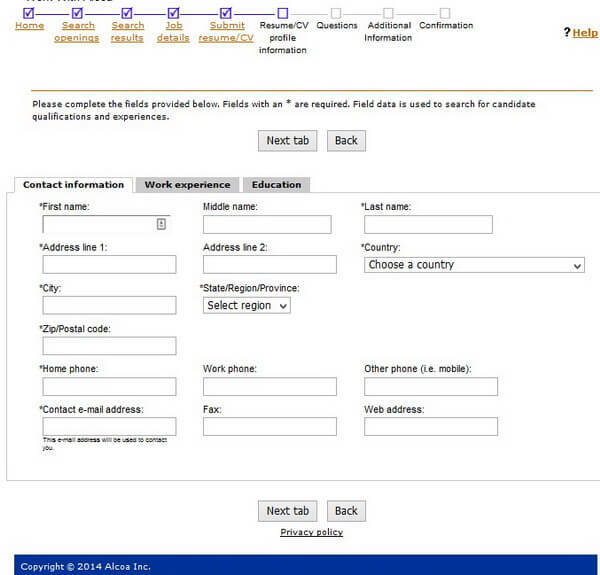 This section of the Alcoa application form requires candidates to provide the main details about themselves. These are typically transferred from their resumes directly. Please note that most of the fields in this section are mandatory. For this section of the Alcoa application form, candidates can create an overview of their professional experience. They can make separate entries for all the previous careers they would like to include in the employment form. For each entry, they will be asked to include the name of their former employers, the positions they have held there, and the duration of their collaboration with the company. Please note that this section of the form is optional. 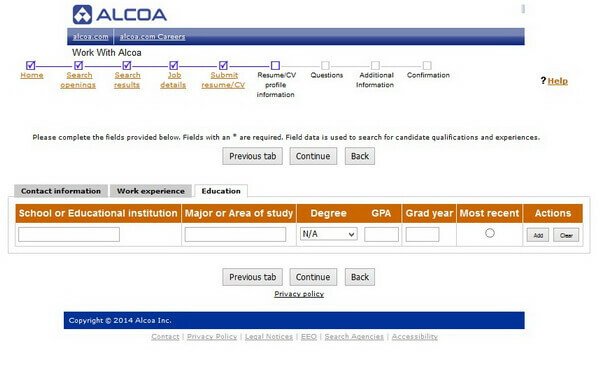 For this section of the Alcoa application form, candidates can create an outline of their academic background. This could prove to be extremely important for the selection process. Candidates must enter the each academic program they have been a part of separately. Please note that this section is optional. For this section of the Alcoa application form, candidates are required to answer to answer a short pre-employment questionnaire. They will be asked to mention how they have heard about the Alcoa careers they have chosen. Then, they will have to answer questions about their legal authorization to work in the United States, as well as their desired salary range. Please note that all of the questions featured here are mandatory. This questionnaire is meant to gather information about the race, gender, and ethnicity of the candidates. Please note that they are required to choose one of the provided answers. However, if they do not wish to disclose this type of information about themselves, they can opt for the “I do not wish to provide this information”. 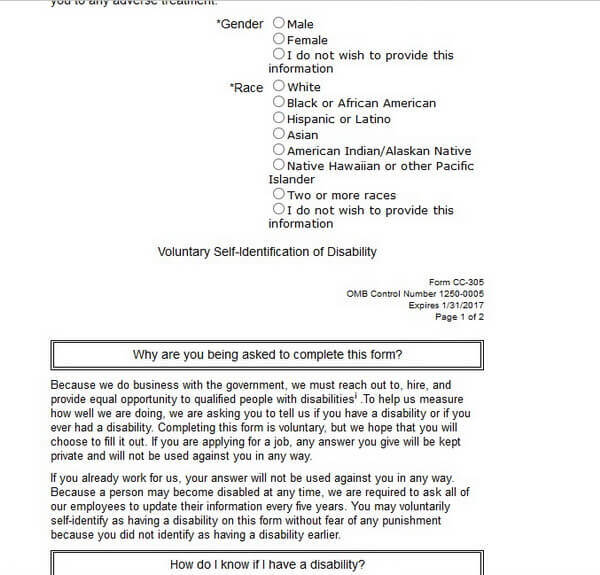 For this section of the Alcoa application form, candidates are asked to mention whether or not they suffer from any disabilities. The information will be used for statistical purposes and the candidates’ chances of employment will not be influenced by their answers. This section of the Alcoa application form required candidates to answer a question regarding their veteran status. Please note that they are not required to disclose this information if they are not comfortable doing so. This is the final section of the Alcoa application form. After completing it, candidates will be able to submit their forms to the Human Resources department for assessment. After they submit their Alcoa applications to the Human Resources department, candidates will be notified that their forms have been successfully delivered. The HR specialists will then contact them to provide them with an answer regarding their employment. 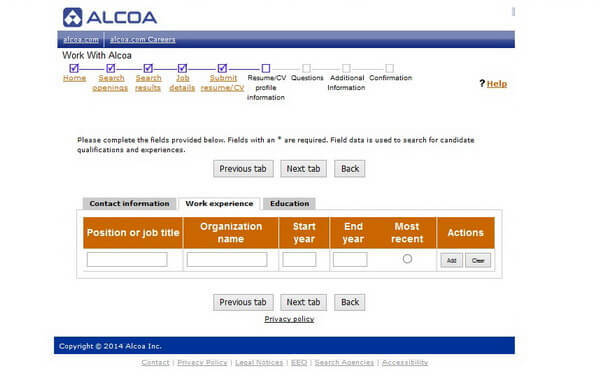 Candidates will find the updated list of Alcoa careers on the online employment portal. They can select their preferred department and location to find the best possible jobs for their needs. Customer Service Representatives will interact with Alcoa’s clients and they will provide them with the information they need about the company and the projects they have in development with Alcoa or those they would like to be a part of. They will display excellent communication skills and their main aim is to provide customers with the best possible experience. The average Alcoa salary for Customer Service Representatives is $20,000 per year. Rates can get as high as $40,000 for experienced employee who deliver stellar performances. They are also entitled to performance-based bonuses, which could increase their overall rates considerably. Job seekers can explore the Alcoa application portal to find the newest job openings in the management sector. They will be asked to submit online employment forms to be considered for their chosen positions. Healthcare Alcoa Benefits – Medical Plan, Vision Plan, Dental Plan, Health Savings Account. Insurance Alcoa Employee Benefits – Basic Life Insurance Plan, Supplemental Life Insurance, AD&D Insurance Plan. Financial Alcoa Benefits – Competitive Alcoa Salaries, Performance-Based Bonus System, Flexible Spending Account , Employee Stock Purchase Program. Retirement Alcoa Employee Benefits – 401(K) Plan, Retirement Plan, Pension Plan. Paid Time Off Alcoa Benefits – Paid Holidays, Paid Vacation, Sick Days and Bereavement Leave. Professional Support Alcoa Benefits – Tuition Assistance, Continuous Job Training, Professional Development Opportunities. Special Alcoa Employee Benefits – Alcoa Employee Discounts, Mobile Phone Discount, Alcoa Employee Assistance Program. The backbone of the Alcoa application form is the candidate’s resume. However, the Submit Resume section is optional. We strongly advise candidates to upload their CVs to the form to provide the hiring specialists with all the relevant information about their professional and academic backgrounds. Whether or not they choose to add a resume, candidates should create a complete overview of their work experience and education for the Resume Profile section. 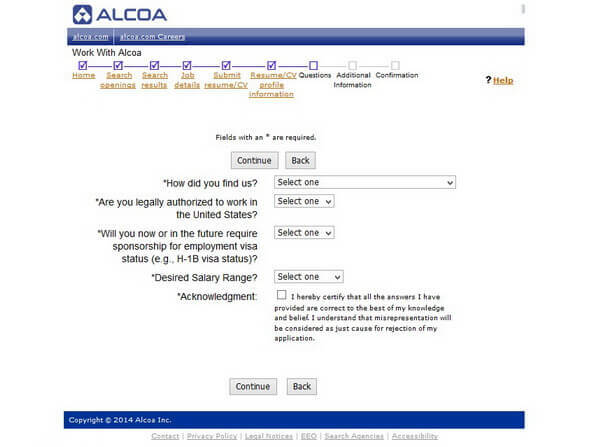 The Alcoa hiring specialists will go through their forms before they review their resumes. This is why they should provide complete information to their forms. The cover letter is also extremely important. 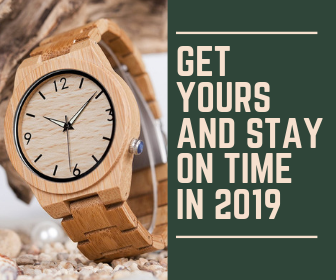 Candidates can include all the details about their professional and personal abilities that make them strong contenders for their chosen Alcoa careers. Their letters should be no longer than one page and they should be written in a formal voice. After the Additional Information section, candidates can submit their Alcoa applications. It is important that they know that there is no separate review section featured in the form. This is why we recommend that they proofread their forms before sending them to the HR office. They can do so after completing each section or when they complete the form. The portal permits them to go back to the previous sections and edit the information they have included before they submit their forms. The Alcoa hiring specialists will review the employment forms and select the strongest contenders for the open positions at the company. They will then contact the selected candidates and schedule them for the interview process, which may feature one to three job meetings. The number of interviews is set according to the specific requirements of the departments chosen by the candidates. To be properly prepared for their Alcoa job meetings, candidates must read about the company’s major achievements. They should also be familiar with the current line of products and services provided by the company to its clients. During the Alcoa interviews, candidates may be asked about the company. They will need to be correctly informed to impress the interviewers. Candidates should also expect to receive questions about their professional experience, their main professional accomplishments, as well as psychological questions. These are meant to assess their level of compatibility with the company. Another aspect that will contribute to the impression they make is their appearance. Candidates are advised to opt for business formal attire and discrete accessories to create a proper interview look. Why have you applied for Alcoa employment? What do you think makes you fit to meet the requirements of your chosen Alcoa career? What are your main professional goals? What do you know about Alcoa? What can you tell me about yourself that is not included in your Alcoa application?